PCTA distributes but does not publish this product. 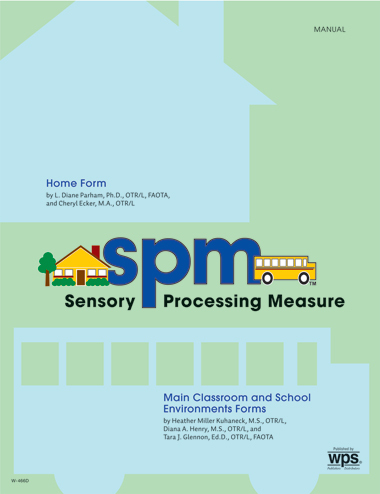 With the Sensory Processing Measure (SPM), you can obtain a complete picture of children’s sensory functioning at home, at school, and in the community. Recognizing that sensory processing problems often manifest differently in different environments, this set of three integrated rating scales assesses sensory processing, praxis, and social participation in primary school children. The assessment’s unique multi-environment approach allows you to see, for example, why a child who functions well in a highly structured classroom may have problems in a more relaxed setting. Firmly grounded in sensory integration theory, the SPM provides norm-referenced standard scores for two higher level integrative functions — praxis and social participation — and five sensory systems — visual, auditory, tactile, proprioceptive, and vestibular functioning. Within each system, it offers descriptive clinical information on processing vulnerabilities, including under- and over responsiveness, sensory-seeking behaviour, and perceptual problems. The Home Form (75 items) is completed by the child’s parent or home-based care provider. The Main Classroom Form (62 items) is filled out by the child’s primary classroom teacher. The School Environments Form (10 to 15 items per environment) is completed by other school personnel who work with and observe the child. A webinar for clinicians who use the Sensory Processing Measure (SPM) and/or the Sensory Processing Measure Preschool version (SPM-P). This webinar was presented in 2011 by Tina Champagne.